Boston Bruins defenseman Connor Clifton (75) and Toronto Maple Leafs center Nazem Kadri (43) shove each other at the goal during the third period of Game 2 of an NHL hockey first-round playoff series, Saturday, April 13, in Boston. A Toronto Maple Leafs player has the game of his NHL career in the playoffs. He checks like a demon all night, playing a key role in suffocating the offence of a team that knocked off the Leafs in the previous season. But late in the game, it turns out he has been nursing a grudge all night after taking a bad hit from one of the opposition players. Well behind the play, with everyone in the building looking at the other end of the ice, the Leaf player finds himself alone with his antagonist. He knocks him unconscious with a vicious elbow to the head. Pandemonium ensues, although the Leafs won the game. But there is an NHL hearing and the Leaf player is suspended for the rest of the playoffs and the first eight games of the following season. While the Leafs managed to win the next game as well to take a 3-2 lead in their best-of-seven series, the opponent got off the mat and won the next two games to eliminate them from the playoffs for the second consecutive year. 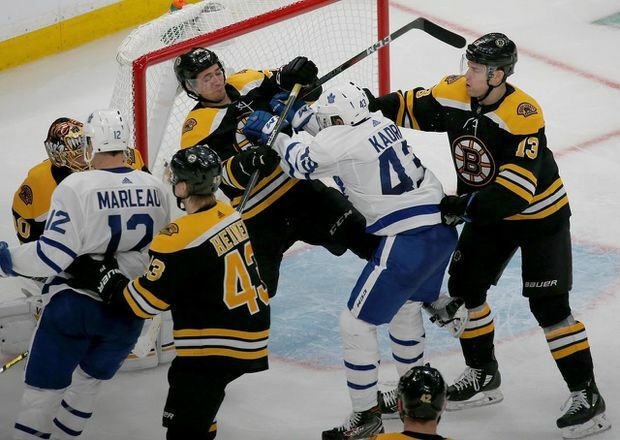 No, we’re not talking about Nazem Kadri, whose cross-check to the head of Boston Bruins forward Jake DeBrusk late in Saturday’s 4-1 Leafs loss probably means he will be suspended for the second consecutive year in a playoff series against the Bruins. The NHL’s player-safety department called for an in-person hearing on the hit, which will take place on Monday before the Leafs and Bruins meet in Game 3 of their series in Toronto. That other vicious hit was delivered by Tie Domi to the head of New Jersey Devils superstar defenceman Scott Niedermayer on May 3, 2001. Niedermayer did not play again in the series but Domi’s hit was seen by his teammates as the turning point in losing to the Devils. And that is what will probably happen to today’s Leafs thanks to Kadri’s equally selfish decision. While he ostensibly went after DeBrusk for driving teammate Patrick Marleau into a stanchion at the players’ bench, a clean hit by the way, it is easy to conclude Kadri was still boiling over a knee-on-knee hit DeBrusk made on him earlier in the game. DeBrusk was not penalized for that hit and referees Trevor Hanson and Brad Meier failed to call a lot of other things as well. The officials’ performance was as poor as it gets in the NHL but that is still no excuse for Kadri losing his cool. There is almost no chance Kadri will play again in this series, which is just as damaging to the Leafs’ chances as it was a year ago when he was suspended for three games for driving Bruins forward Tommy Wingels head-first into the boards. Kadri is your classic repeat offender. In the past six years, he has been suspended four times for a total of 14 games. Add his three fines on other occasions and this will be Kadri’s eighth visit with the NHL’s disciplinarians. Since the player-safety department offered Kadri an in-person hearing, it means the league now has the option to suspend him for at least five games. He will be lucky if that’s all he gets. As with the Domi situation, this came during a game in which Kadri was playing tremendously. While his teammates were wilting under the Bruins’ fore-checking, Kadri was showing his mettle and hitting back. He also scored the Leafs’ only goal and in the first game of the series, a 4-1 win, Kadri’s perfect stretch pass to William Nylander resulted in a key goal. It is this combination of physical play and skill that makes Kadri such an important player for the Leafs when he is under control. As the Leafs’ third centre behind John Tavares and Auston Matthews, he also creates matchup problems for opposing teams. The problem is he lacks judgement and obviously will not learn from history, neither his team’s nor his own. Thus, Kadri could have played his last game as a Maple Leaf. While the Leafs desperately need the grit and skill Kadri has, it has to come with self-control. Given the salary-cap issues that Leafs general manager Kyle Dubas faces this summer and the fact Kadri’s US$4.5-million cap hit over the next three years makes him an attractive commodity to other teams willing to take a chance on his temper, it will not be a surprise if he is traded. “Obviously, it’s disappointing for Naz, it’s disappointing for our team,” Leafs head coach Mike Babcock said on Sunday. “One of our key areas is depth through the middle and obviously Naz is a good player, he’s done good things. At this point, it looks as though it will be the Bruins moving on, not to mention Kadri.